Win a round without losing a teammate in a 5-on-5 or bigger match-up. Win a split-screen round where neither you nor your buddy are eliminated. Win a 7-on-7 or higher non-reinsertion game where you eliminate all opponents. Get three or more eliminations in a round with over 25% accuracy. Eliminate three or more opponents with a single grenade. Dive or slide 100 times. Win a round with 3+ eliminations using a marker without having to reload in a 5v5 or larger match. Win a round entirely from the prone position. 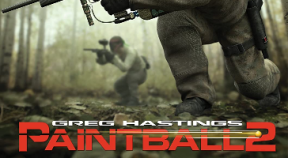 Eliminate an opponent that you can't see using the paintballs' trajectory. Shoot an opponent in the back from their own side of the field. Using a pump-gun, eliminate 3 or more opponents in a round without missing. Win a woodsball and a speedball tournament. Eliminate three opponents by shooting them in the goggles in a single round. Eliminate an entire enemy team using a single pistol clip in a non-reinsertion game. Win a round where you issue field commands to at least 3 teammates. Play games with teammates from 50 real teams. Win an event while using the jersey, pants and marker from the same manufacturer. Eliminate three opponents in a single round with a completely fogged mask. Completed all events on the hardest difficulty setting. Eliminate an opposing flag carrier with a rocket. Successfully cheat five times in a row without failing. Win a round while wearing the “Rodeo King” mask.